Double Triggers - one for each barrel. Double triggers are better than single triggers on a double gun because: 1. They are simpler in design, therefore making the gun lighter and more reliable. 2. They are less prone to double-firing. 3. In the hands of an experienced shooter they are faster. 4. 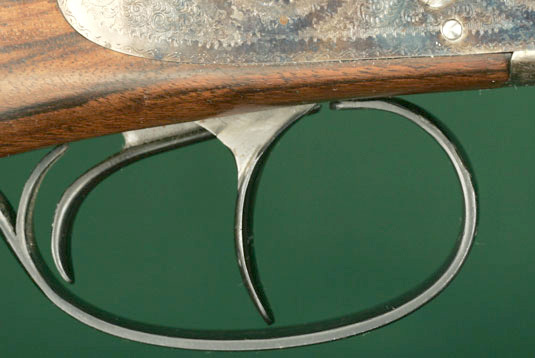 They allow immediate selection of which barrel to fire - the immediate selection of the pattern to throw - even while the grouse is flushing. 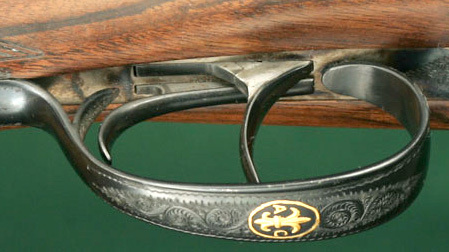 Note, that while the two triggers appear to be front and rear, they are actually left and right, directly operating the sears of their respective barrels.